In this laboratory, we focus on the genes expressed in the brain and investigate behavioral functions of the genes by conducting a comprehensive behavioral test battery on genetically-engineered mice. The primary goal of our research group is to reveal the functional significance of genes expressed in the brain. To date, mouse models of psychiatric disorders, such as schizophrenia and bipolar disorder, have been successfully identified. In some of these mutant mice, almost all neurons are arrested at a pseudo-immature state, even at adulthood, in a small region of the brain called the dentate gyrus, which plays an important role in cognitive functions and mood regulation. This phenomenon was named “immature dentate gyrus (iDG).”In addition, it was confirmed that an iDG-like phenomenon also occurs in the brains of patients with schizophrenia or bipolar disorder. The iDG phenotype may underlie some of the symptoms of psychiatric disorders, such as cognitive deficits and hallucination, or psychosis. By using those mice, we seek to elucidate the molecular or neuronal mechanisms underlying the iDG phenotype and to develop new methods for the diagnosis, prevention, and treatment of psychiatric disorders. Arc gene is inducted by neural activity in the dentate gyrus of control mice(gleen),but not in that of in that of Scnurri-2 KO mice. 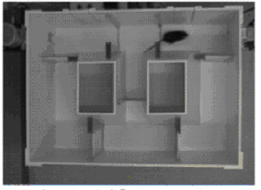 Our basic method to reveal a behavioral significance of a gene is to conduct a systematic and well-defined behavioral test battery with mice that have mutation on the gene of interest. The behavioral test battery covers relatively broad range of various behavioral domains, such as learning and memory, sensory-motor functions, emotions, motivation, and drug sensitivity/preference. By doing that, we believe that we can find actual behavioral significance of the gene of interest in a quite efficient manner. In fact, according to our experience of behavioral studies on many strains of mutant mice, it is not very often (or it is even rare!) that the main phenotype is in accordance with the hypothesis of the mice creators, if the behaviors are carefully examined by test battery with the policies. Once we establish any behavioral significance of the gene, we could then pursue how it exerts its effects on the behavior. To investigate it, we usually need to look at things at multiple levels of neuroscience. Therefore, behavioral test battery can work like a "hub"
1.Hagihara H, Takao K, Walton NM, Matsumoto M, Miyakawa T. Immature dentate gyrus: an endophenotype of neuropsychiatric disorders. Neural Plasticity. 2013. doi: 10.1155/2013/318596. 2.Takao K, Kobayashi K, Hagihara H, Ohira K, Shoji H, Hattori S, Koshimizu H, Umemori J, Toyama K, Nakamura HK, Kuroiwa M, Maeda J, Atsuzawa K, Esaki K, Yamaguchi S, Furuya S, Takagi T, Walton NM, Hayashi N, Suzuki H, Higuchi M, Usuda N, Suhara T, Nishi A, Matsumoto M, Ishii S, Miyakawa T. Deficiency of schnurri-2, an MHC enhancer binding protein, induces mild chronic inflammation in the brain and confers molecular, neuronal, and behavioral phenotypes related to schizophrenia. Neuropsychopharmacology. 2013. 38: 1409-1425. 3.Shin R, Kobayashi K, Hagihara H, Kogan JH, Miyake S, Tajinda K, Walton NM, Gross AK, Heusner CL, Chen Q, Tamura K, Miyakawa T, Matsumoto M. The immature dentate gyrus represents a shared phenotype of mouse models of epilepsy and psychiatric disease. Bipolar Disord. 2013. 15: 405-421. 4.Walton NM, Zhou Y, Kogan JH, Shin R, Webster M, Gross AK, Heusner CL, Chen Q, Miyake S, Tajinda K, Tamura K, Miyakawa T, Matsumoto M. Detection of an immature dentate gyrus feature in human schizophrenia/bipolar patients. Translational Psychiatry. 2012. 2: e135. 5.Yamasaki N, Maekawa M, Kobayashi K, Kajii Y, Maeda J, Soma M, Takao K, Tanda K, Ohira K, Toyama K, Kanzaki K, Fukunaga K, Sudo Y, Ichinose H, Ikeda M, Iwata N, Ozaki N, Suzuki H, Higuchi M, Suhara T, Yuasa S, Miyakawa T. Alpha-CaMKII deficiency causes immature dentate gyrus, a novel candidate endophenotype of psychiatric disorders. Molecular Brain. 2008. 1: 6. 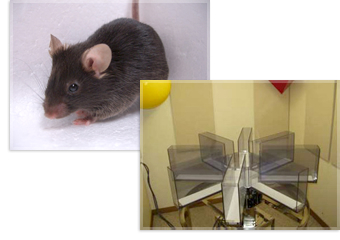 6.Miyakawa T, Leiter LM, Gerber DJ, Gainetdinov RR, Sotnikova TD, Zeng H, Caron MG, Tonegawa S. Conditional calcineurin knockout mice exhibit multiple abnormal behaviors related to schizophrenia. Proc Natl Acad Sci USA. 2003. 100: 8987-92. ©Fujita Health University All Right Reserved.